​​70 years ago - Danette Reilly is born. ​53 years ago - 17-year-old Danette begins studying vulcanology. ​45 years ago - 25-year-old Danette discovers a volcanic cave with mystical properties. 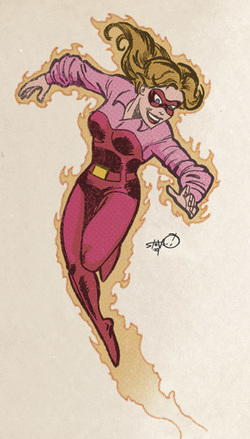 she adopts her Firebrand identity to save her brother from gangsters. ​38 years ago - 32-year-old Danette joins the All-Star Squadron. ​32 years ago - 38-year-old Danette's powers fade. She retires and returns to her research. ​27 years ago - 43-year-old Danette's former lover & All-Star Squadron villain Cyclotron's son Albert Rothstein is born. Danette becomes his foster mother. ​11 years ago - 59-year-old Danette's foster son Albert Rothstein's powers manifest. He becomes Nuklon. 6 years ago - 64-year-old Danette is killed by Kobra hijackers. Danette Reilly wasn't the original Firebrand. The character was her brother, and wore almost exactly the same costume, which is something the surprisingly few people ever cosplay. 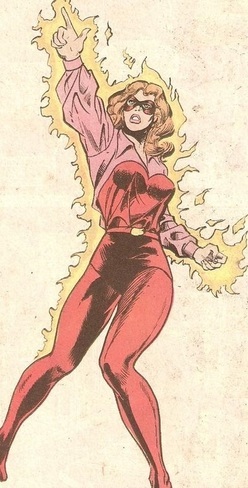 Danette made the role make a little more sense by actually having fire-based powers, but the character never became exceptionally prolific beyond her part with the original All-Star Squadron. In the comic, she was the grandmother of Albert Rothstein, but making her his foster mother was much simpler. Of course, Albert's career includes a period of anti-hero-ness which tied him very nicely into the Suicide Squad, but the impetus for that part of his story was always the murder of his mother. Having his mother already established as part of his story helps quite a bit. There's a certain symmetry making this character a part of our revamped All-Star Squadron so that she can be of an appropriate age to be Al's foster mother. Sometimes these things just work out.